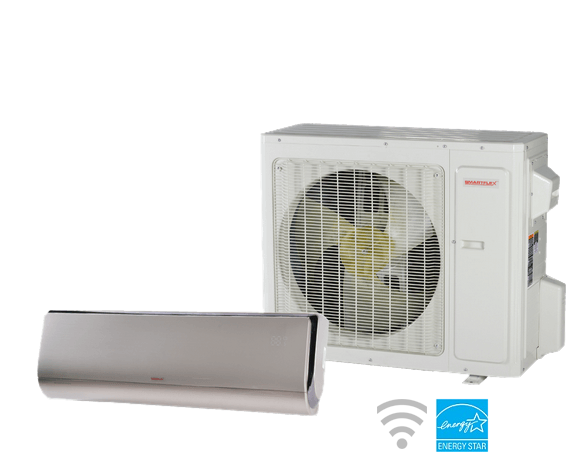 This ultra-high-efficiency, smart Inverter Heat Pump lowers energy bills without sacrificing comfort. Wi-Fi technology allows direct control from smartphones or tablets for maximum convenience. High-quality construction guarantees years of trouble-free operation. And the streamlined design of the Wall-Mount Unit enhances any décor. Ultra-high efficiency (up to 30.5 SEER). 80% heating capacity at -20° F.
System features a standard wireless remote controller. WiFi Smart app enables control through iOS and Android devices (adapter required).